Day 0: Saturday 31st May 2014 (29). Day 1: Sunday 1st June 2014 (76 + 4 Butterflies (80)). Day 2: Monday 2nd June 2014 (50). Day 3: Tuesday 3rd June 2014 (63 + 18 Butterflies + 4 Dragonflies (85)). Day 4: Wednesday 4th June 2014 (31 + 11 Butterflies + 3 Dragonflies (45)). Day 5: Thursday 5th June 2014 (41). Day 6: Friday 6th June 2014 (185 + 1 Butterfly (186)). Day 7: Saturday 7th June 2014 (17). Total Pictures: 533, (492, and 41 Butterflies / Damselflies). Click here to return to the General 2014 Pictures page. 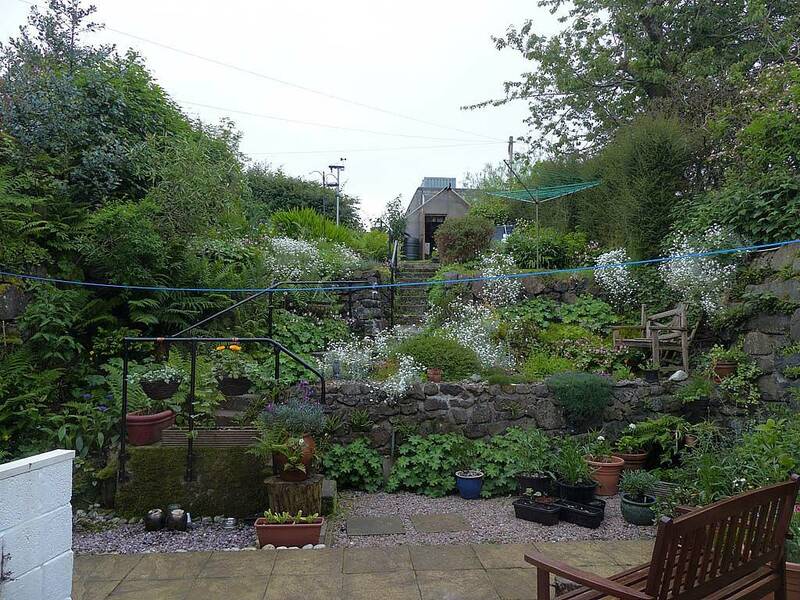 I spent a week on the Isle of Mull, staying with Jack Harrison. The main target was the legendary Chequered Skipper butterfly that only exists in the Fort William and surrounding areas. The weather forecast was an uncertain one but there was potential for some weather windows. Even if that didn't happen, there was always the amazing scenery and other wildlife, and catching up with Jack and Stella. I raced north on Saturday 31st May in a newly acquired car. On Sunday the weather wasn't that great but that meant a nice slow start followed by a tour of Mull. We saw plenty of wildlife too including both Golden and White Tailed Eagles. On Monday the bad weather continued but we had a nice trip to Glengorm which at about 800 feet was at cloudbase. For a while the cloud was just high enough for some panoramic views across the water to Ardnamurchan, the most Westerly point of the British mainland. With improving weather on Tuesday we took the ferry from Tobermory to Kilchoan on Ardnamurchan and drove across to Strontian. After a long search in a nearby nature reserve I finally found one single Chequered Skipper, with 2 others spotted by other people. Then on the way back at another stop we found 3 more. Result! Going back the visibility was sparkling with clear views of Rhum and Eigg, and the Cuillins of Skye. The good weather continued on Wednesday. We went to Fishnish and prospected for Chequered Skippers. But none were found. Then onto Grass Point,hoping but failing to see Marsh Fritillaries. However it was a pleasant walk. With more poor weather on Thursday we went to Calgary Bay. The rain stopped just as we got there and the highlight was seeing both Great Northern and Black Throated Divers. We stopped at Croig and Dervaig on the way back for more scenery and wildlife. Then we decided to go on a boat trip on Friday. The weather was the best all week, warm sunny and almost no wind. At Lunga Island thousands of Puffins, Razorbills, Guillemots, Shags and other sea birds. Plus some awesome panoramic views from the 300 foot summit. Even peaks of South Uist on the Outer Hebrides was visible. Then we visited Staffa Island and Fingal's Cave. 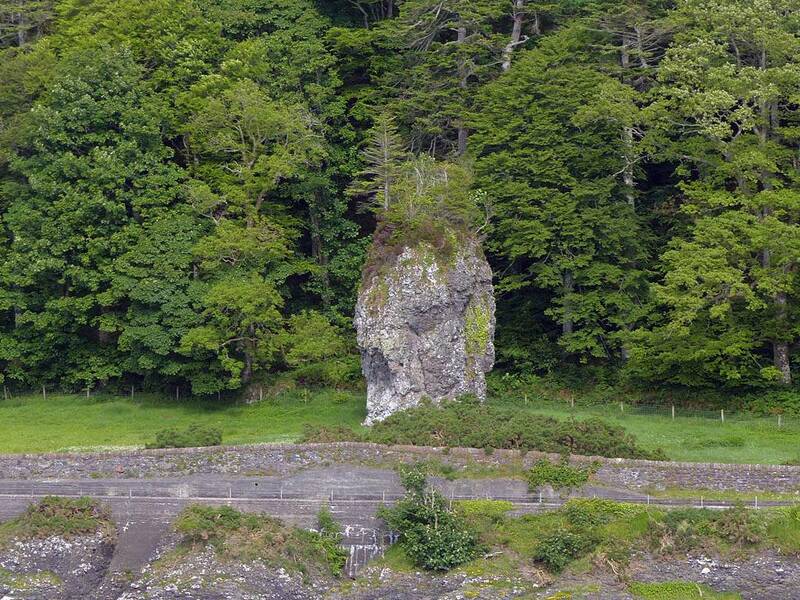 This place was the answer to Northern Ireland's Giant's Causeway. That made a great end to a trip. The following Saturday was a nice drive back home after a lovely break. Photos Saturday 31st May 2014, The Long Drive North! I got up early and was on the road by about 6:30AM. I had a great drive North in perfect weather, and with not a single traffic jam I was at my Carlisle petrol stop after 4h30m. Then I carried on North into Scotland. The only busy part of the day was going past Glasgow, over the Erskine bridge and onto the A82. Once past the tight and twisty sections alongside Loch Lomond stuck behind very slow other motorists, I cruised on and made it to Oban around 3pm. I was booked on the 6pm ferry but tried to get on the 4pm ferry. I just made it on, one of the last cars to get on. 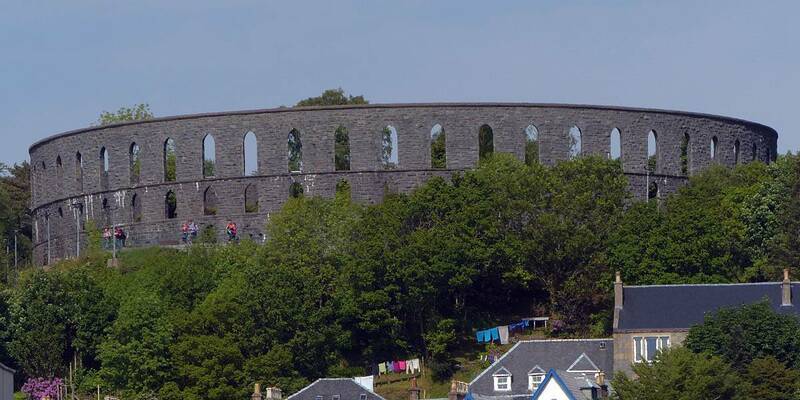 McCaig's Tower. 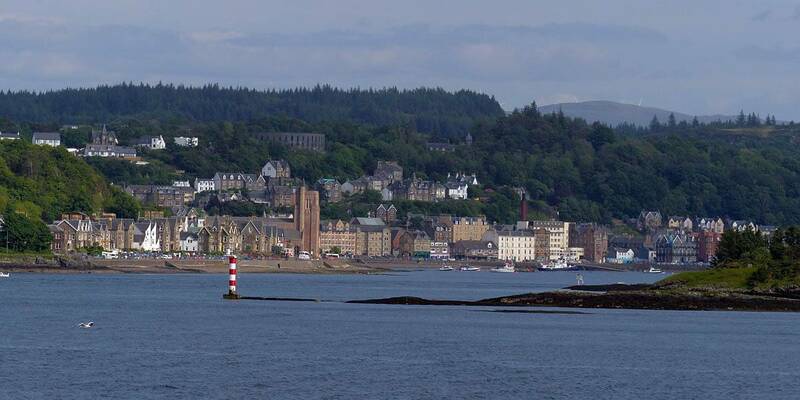 View into Oban from the ferry port. 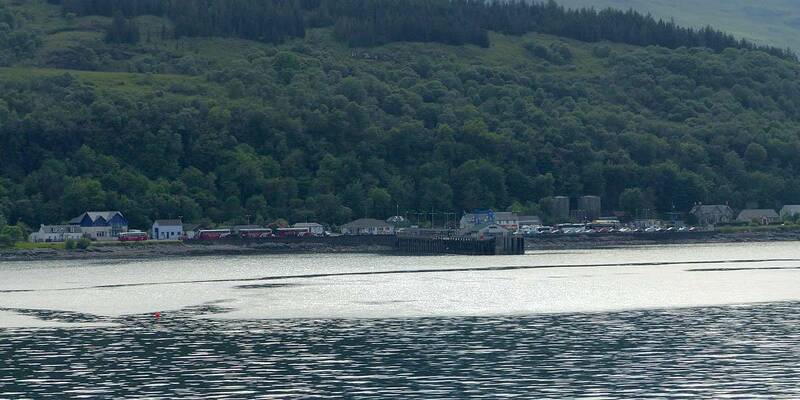 Oban - Craignure ferry arriving. 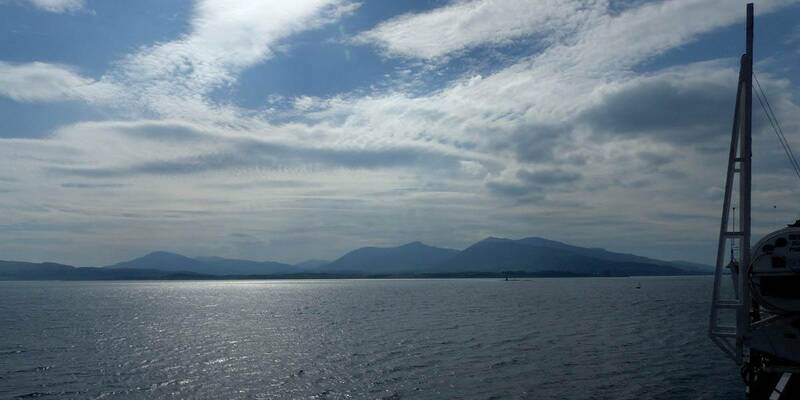 It was a lovely ride to Craignure from Oban. Between soaking in the scenery I had a nice cup of tea too. The 45 minute crossing seemed to be over in a fraction of the time. 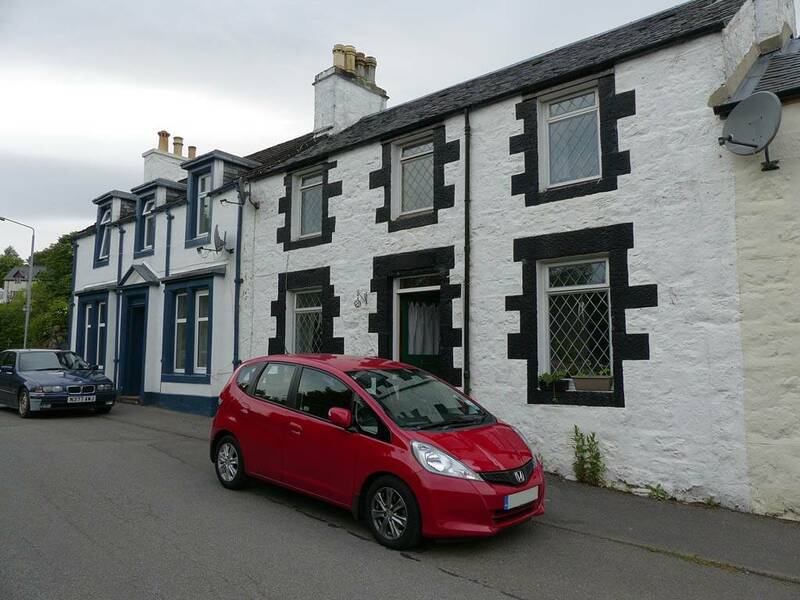 Before long we were arriving at Craignure and it was time to return to the car. Views of Oban as the ferry departs. 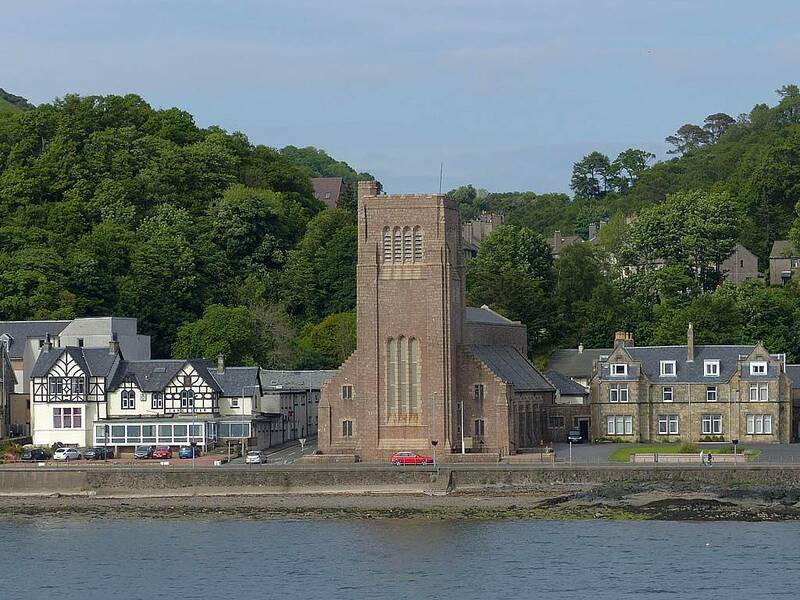 St Columba's Cathedral. 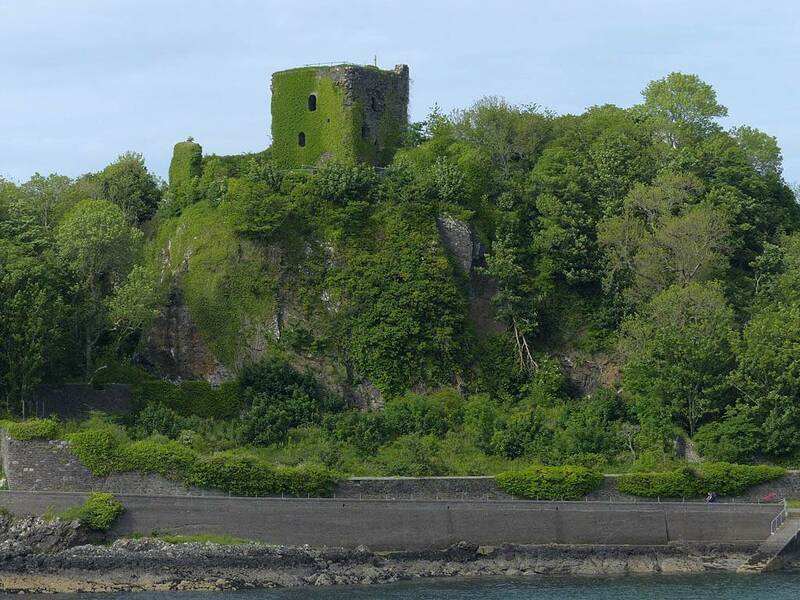 The Dog Stone and Dunollie Castle just outside Oban. 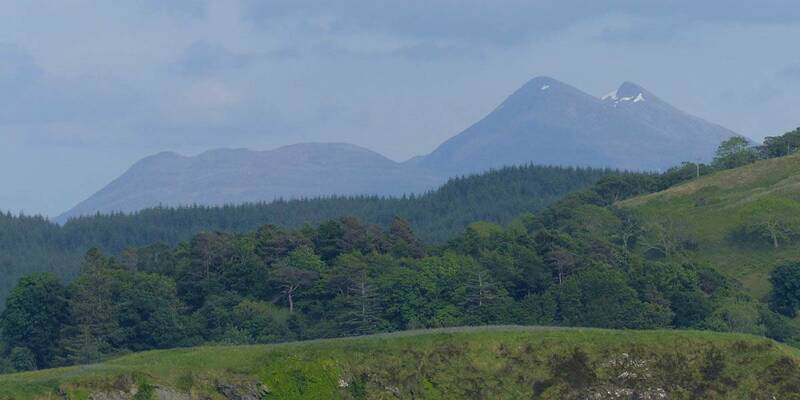 Ben Cruachan contains a hydro-electric reservoir. 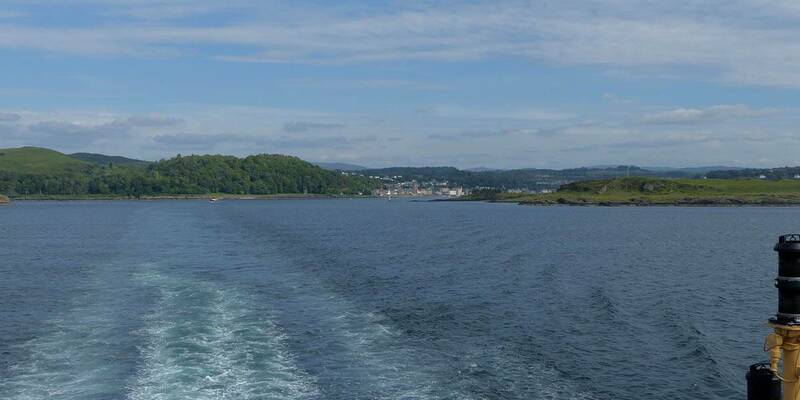 Looking back to Oban from the Northwest past the northern tip of the island Kerrera. Lady's Rock with the Eastern coast of Mull beyond. Scottish mountains in the distance (to the South I think). 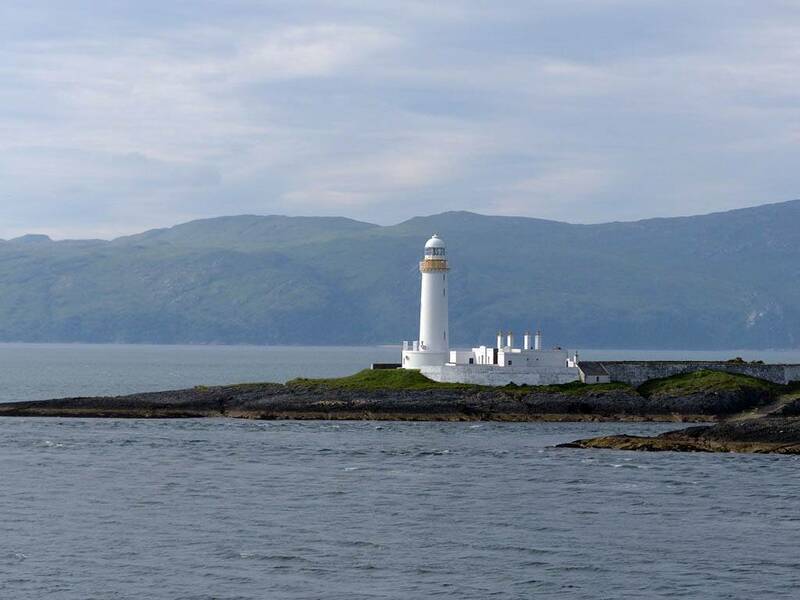 The lighthouse on Eilean Musdile, off the end of the Southern end of the island Lismore. 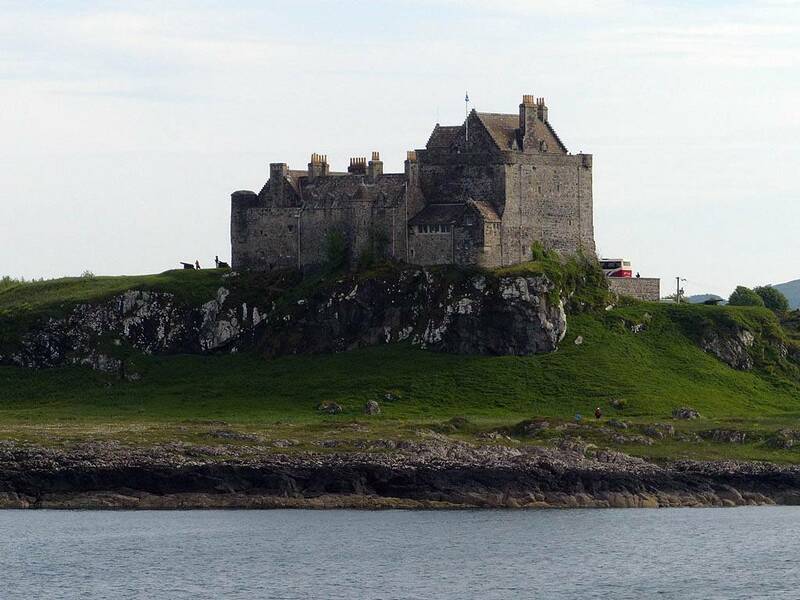 Duart castle on Mull. Panorama on board the ferry. 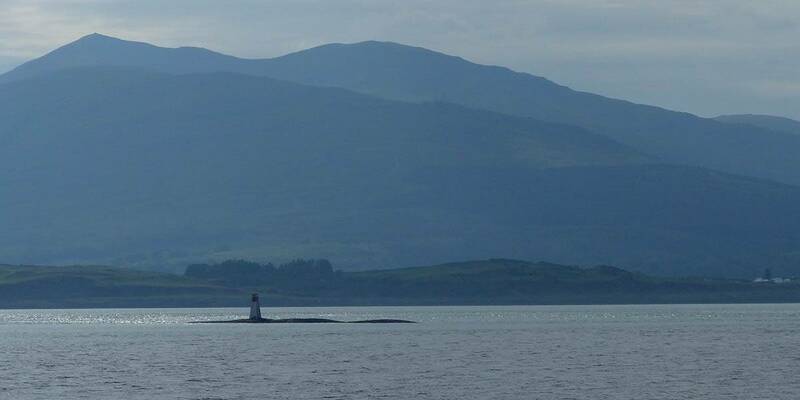 Approaching Craignure. 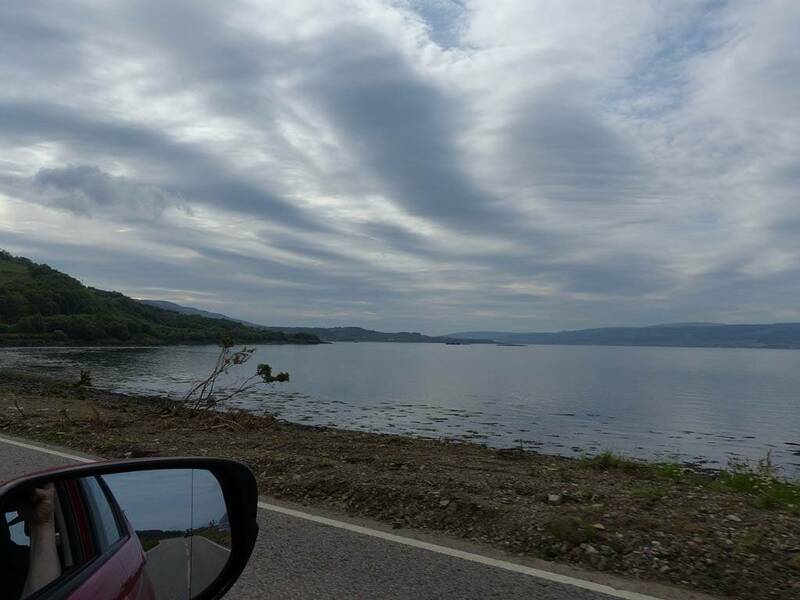 The drive along the main road from Craignure to Tobermory was gorgeous. 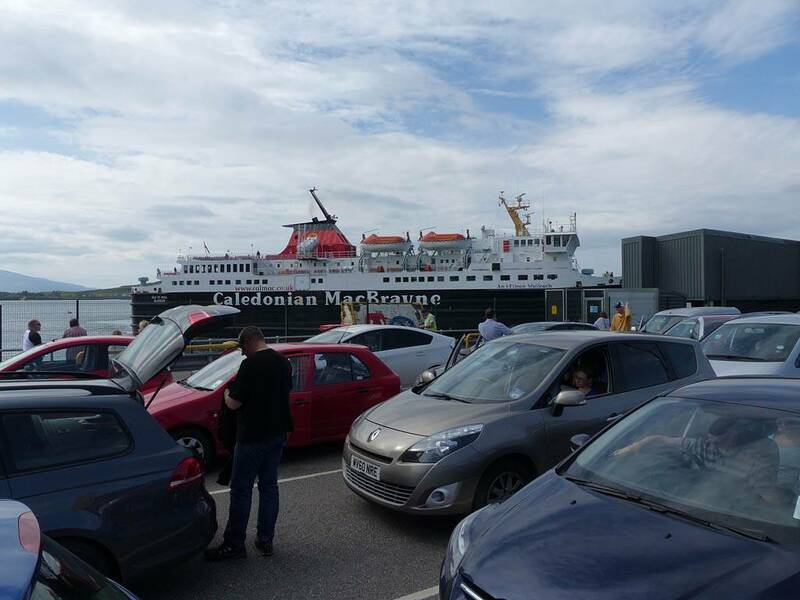 I was at the back of a long line of traffic from the ferry, as I was one of the last cars off. However this wasn't a problem. I was in no rush, enjoying the views. A section of the road is single track, and we had to stop many times to pass traffic going the other way at the passing places. These were good opportunities to take photos. 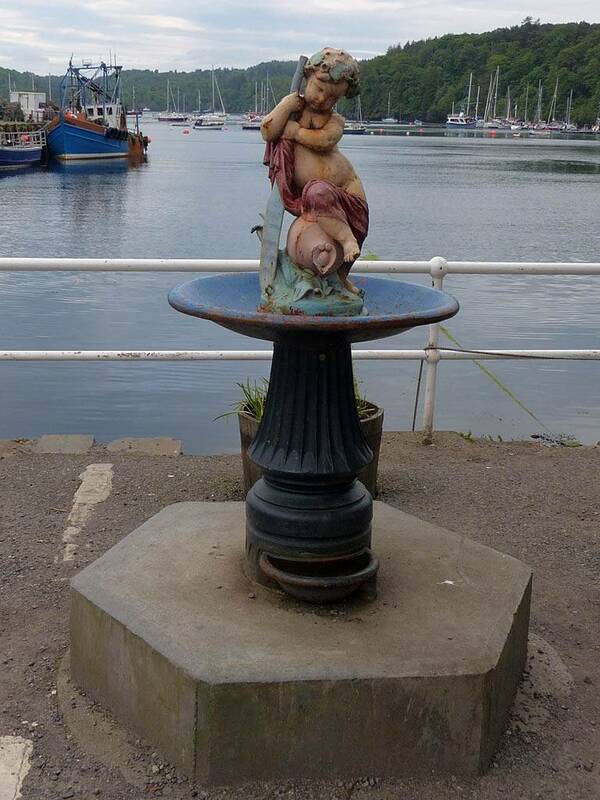 Before long I arrived in Tobermory and soon found Jack's place. We first went to the main street for a quick look around and to get some supplies. Then after along day I was ready for an early night's sleep! 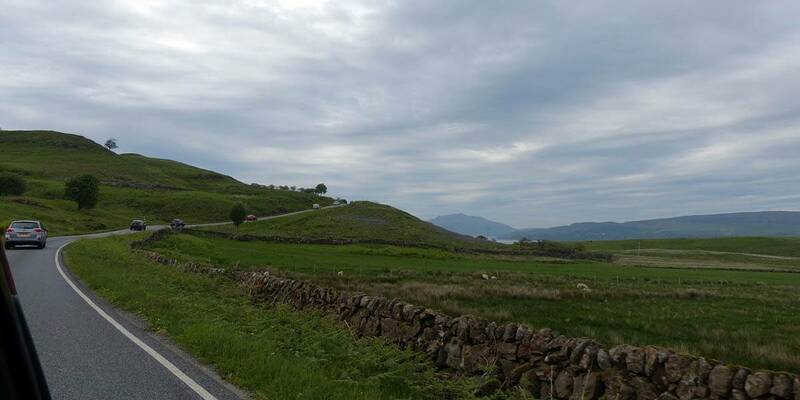 Driving along the main road from Craignure to Tobermory. When the traffic stopped at passing points on the single track section that was a good opportunity to take pictures. 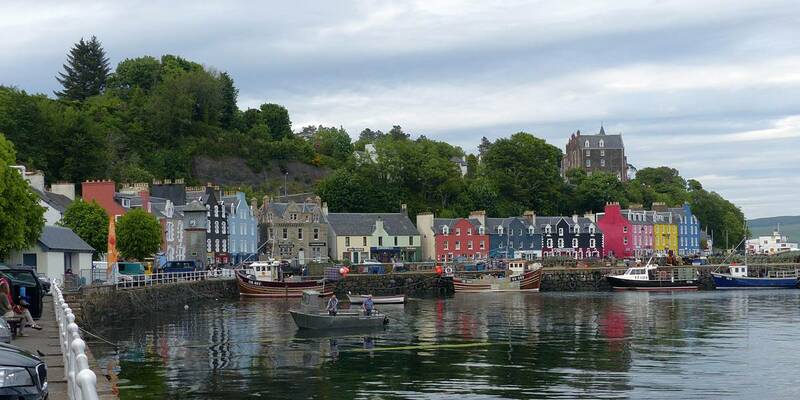 Tobermory. 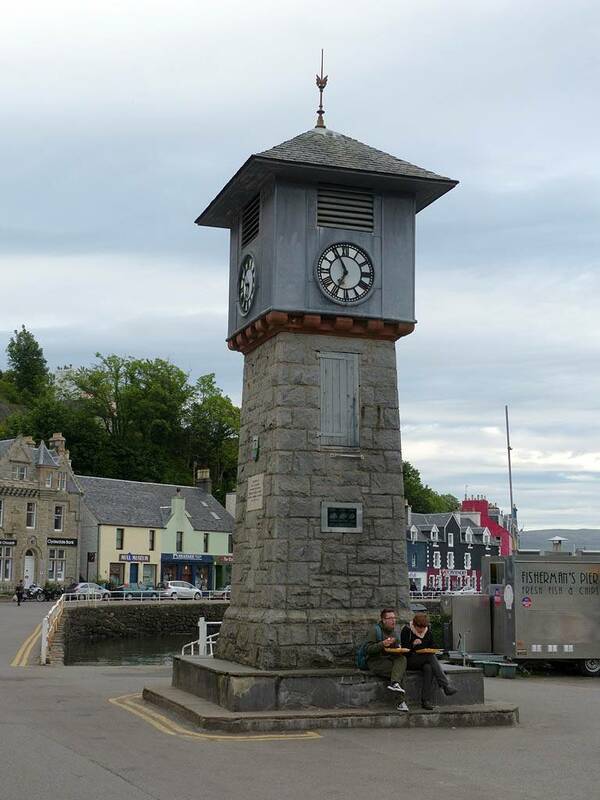 The clock tower and a stastue on Tobermory's main street. Parked outside Jack's place. Jack's garden. 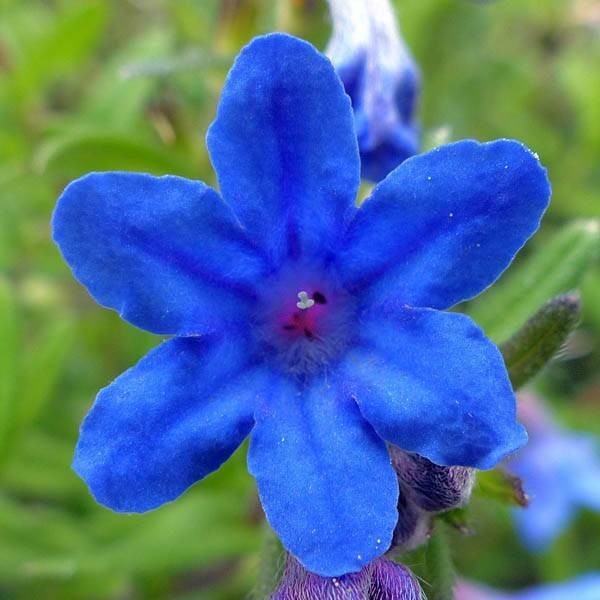 A closeup of a flower in the garden. 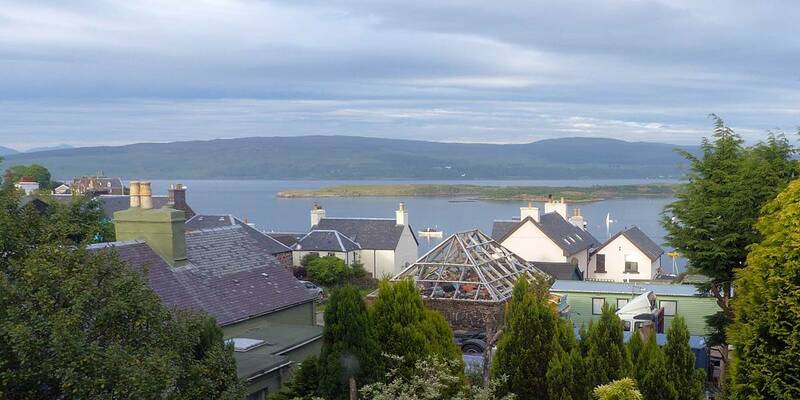 The view from Jack's place past Calve Island to the Sound of Mull and Morven beyond. Day 0: Saturday 31st May 2014. Day 1: Sunday 1st June 2014. Day 2: Monday 2nd June 2014. Day 3: Tuesday 3rd June 2014. Day 4: Wednesday 4th June 2014. Day 5: Thursday 5th June 2014. Day 6: Friday 6th June 2014. Day 7: Saturday 7th June 2014.